“Thanks for allowing our large family to stay in your place"
"This was a stunning beautiful, spacious, and clean home overlooking the southern coast of Fiji"
We had an amazing few days in this beautiful Fijian home. We were greeted by our wonderful house crew, Eseta and Pisa, to a beautiful sunset with a view of the Pacific Ocean. Fabulous location close to many delicious local restaurants, access to nearby resort The Hideaway Inn, and many opportunities for local cruises and day trips, booked through Rosie’s next to the resort. Rooms are large, clean, and comfortable. Great communication with owner- we would recommend and come back! We did the Ooh LaLa day cruise booked through Rosie’s, which was phenomenal. Loved the place! It was so neat, clean and pretty, right up to the little Fijian details everywhere. So ideal for families! Although it does have a steep drive way! This makes it a bit of a mission to reach the house. However for those that love a bit of an early morning walk or just a little daily workout, you definitely wouldn't mind! Definitely worth the money we paid, and where the house is located, when you do reach the top it is amazing for view and breeze! The hosts Eseta and Pisa both deserve 5 stars too. So amazing and helpful! Would definitely highly recommend!!! So worth it. Eseta is a lovely and really helpful housekeeper, without her the villa will be not the same. 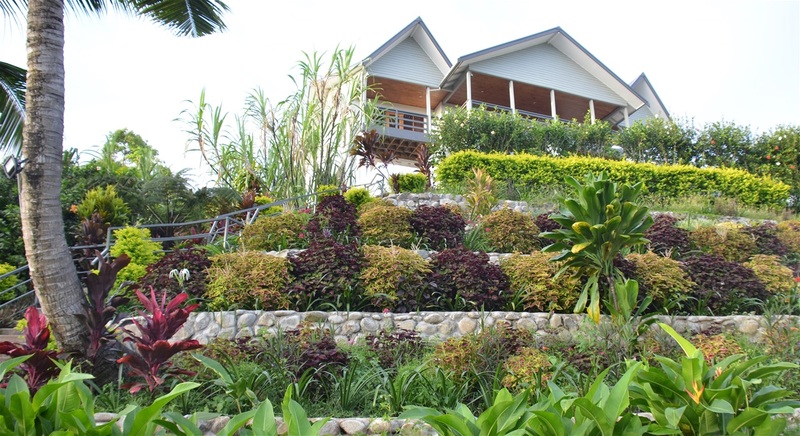 We spent 10 very enjoyable days at the Fijian Oasis the house is in a lovely elevated position overlooking the sea. Eseta the housekeeper does an amazing job and is there for anything you may need. Outside the gardens speak for themselves on what a great job Pisa does. The furniture and fittings inside and outside are all top quality and the house is fully equipped with everything that you would need. Nous sommes très contents du séjour et de la maison et du personnel Eseta et Pisa. "An amazing villa with excellent amenities"
An amazing villa with excellent amenities. Gorgeous views, the bonus use of a beach side pool on the beach with a clubhouse. Everything was more than we could have hoped for. But by far the best thing about this Villa is the kindness and love we received from Eseta. She took care of us every day. She prepared delicious meals at our request and made by far the best lovo I ever had. We went shopping at the market for food and she arranged a waterfall tour at the village. This villa would be average without her smiling face and love. Thank you for all you did Eseta. You are definitely worth your weight in gold. I hope you will be there when we return. Oh and she arranged an excellent deal at the local village store. I love my cava bowl. "This was a fantastic place for a large family"
This was a fantastic place for a large family as we had. It is advisable to hire a car if you are going to use this house. Had excellent access to the beach and was clean and very comfortable for all of us. Eseta (house keeper) and her team were great and could really provide a good anchor to feeling at home with the Fiji Island life. Would highly recommend this house to anyone with a big family or two smaller families. The house and other amenities were excellent. The staff (Eseta and Pisa)was great and were always asking if there was anything they could do to assist us. The only issue was loss of Internet on our last full day. The club house needs to better manage it's pool table and cue sticks. The house was as described in all advertising and excellent value for money - beautifully appointed, comfortable and Eseta and Pisa were lovely hosts. Wonderful views and easy access to the private pool and nearby beach. The hosts provide very good details when you book and say that car hire could be a useful option. I would agree if you want to do a lot of sightseeing or go to many different restaurants, but we found there were enough facilities within walking distance and local buses and taxis made it relatively easy to move around. "Our stay here was magnificent!" Our stay here was magnificent! The lovely housekeeper Eseta made us feel welcome and had the house absolutely spotless each and every day. Pisa the caretaker keeps the gardens looking beautiful - what a lovely gentleman! The house is absolutely beautiful with high quality furniture throughout. 2 huge bedrooms - each bedroom with 1 Queen, and 3 singles - comfortable beds for at least 10 people. Each bedroom has its own bathroom. All cooking facilities (first class appliances) and utensils are provided, all you need to do is the shopping (check out the markets for the freshest food). If you ask Eseta she will gladly go shopping with you and cook you the MOST AMAZING Fijian dishes! Eseta is a wealth of knowledge about Fijian culture and history and she also knows the best places to buy good quality souvenirs. The view is spectacular from the large balcony, the beach only a few minutes walk away. Guests have full use of the pool down at the Maui Bay Clubhouse. The house is located on the beautiful Coral Coast and things to do are close by. We highly recommend renting a car so you can get out and see and experience everything. "We will recommend it to our family and friends as it was all we wished for in a holiday as staff were awesome"
The accommodation and facilities were excellent and the staff were just awesome. There was nothing we didn't like only need to have a 4 slice toaster. "This villa was extremely comfortable, with the most amazing views"
This villa was extremely comfortable, with the most amazing views. It was well equipped and beautiful. Eseta was the most gracious hostess. Ten out of ten. "The house is absolutely beautiful, everything is provided and the view is amazing"
The house is absolutely beautiful, everything is provided and the view is amazing. Completely lives up to expectations in that respect. But by far the biggest highlight was Eseta who is an absolute godsend! She made us feel so welcome showed us the local markets, organised a kava ceremony with the local village as was just all round amazing, took our stay to a whole different level. Would highly recommend a visit. "Beautiful home, well furnished, with a great view from the deck"
Beautiful home, well furnished, with a great view from the deck. The place is immaculately maintained by the housekeeper Eseta and the gardener Pisa. My wife and I spent five days at Bill and Carmel's house and enjoyed every moment of it. The main bedroom is very bright, has a door leading onto the deck, and has a dressing area and a large bathroom. The living room, kitchen and dining table are in a very large room, which has floor to ceiling windows on one side facing the deck and towards the ocean so the room has very open feel to it. The second bedroom is similar to the first but without the dressing area. We would highly recommend this place to our friends and family. "If you are looking at a place to stay to get away from it all"
If you are looking at a place to stay to get away from it all, the Fijian Star has to be it. Once you walk in the door, the ocean view just hits you. We spent many lazy hours on the deck just relaxing. The house was extremely clean and well catered for families. Eseta and Pisa made our stay all the more welcome. I cannot say enough about this place. And the pool?? What a bonus!! Thanks Bill for your hospitality. My family and I were very impressed with the house; it was spotless, had great amenities and had the best views ever! A special thanks to Eseta and Pisa who were absolutely wonderful. They took care of our every need and we felt as if we learnt a lot more about the Fijian people through our conversations. Meeting and sharing a lovo with Eseta's family was a real highlight. We also loved the pool and facilities by the water, which we made use of every day. What a place and what a stay. We will definitely be back! The house is beautiful, fully equipped, the view is beautiful. Eseta & Pisa were very helpful & friendly, making us feel very welcome. The location for snorkelling is wonderful. We had rented a van that we discovered had fairly bald tyres and not good traction, therefore had difficulty with the steepness of the driveway. We were fine with the stairs though. "The home was beautiful and well maintained"
The home was beautiful and well maintained. It looks exactly like the pictures .The pool in the pictures is not attached to the home. "Superb location for a Coral Coast family holiday"
Delicious arrival drinks were provided by Eseta. The garden kept by Pisa is simply beautiful. They were both wonderful to our family. The Fijian Star is well appointed and functional for family needs. There are lots of places to visit within a half hour drive including the Warwick Hotel, Kula Wildlife Park and markets at Sigatoka. A fantastic base for a family holiday. Could have stayed longer! "An excellent place for a family Fiji holiday"
The house was as described in all advertising and excellent value for money - beautifully appointed, comfortable and Eseta and Pisa were lovely hosts. Wonderful views and easy access to the private pool and nearby beach.The hosts provide very good details when you book and say that car hire could be a useful option. I would agree if you want to do a lot of sightseeing or go to many different restaurants, but we found there were enough facilities within walking distance and local buses and taxis made it relatively easy to move around. "The house and grounds are lovely. Staff very helpful"
"We loved Fiji the locals and they are the kindest people I've ever met." Me and my family had a fantastic stay at the beautiful villa. The view overlooks the ocean and the interior of the house had a lot of space filled with lovely furtinure/wall deco. It pretty much provides you with everything you need from beach towels to snokeling, kyaking gears, straighters, board games, and many more. It has a pool and beach access down at the sea front. Our stay wouldn't have been amazing without the lovely service of Eseta (housekeeper) we would always came back to fresh new shower towels, clothing already washed and always a tidy home. She always made herself available & very helpful. She always wore a smile on herself. To Pisa the caretaker of the villa who also played apart on our amazing stay. Every morning he was outside working very hard to keep the land/gardens looking stunning and would give us some fresh bananas. Thankyou Bill & Carmel for letting us stay in your beautiful and to Eseta for making our stay properly the best one so far. My mother adores you and has recommend the villa to her friends and family travelling to Fiji. "Most friendly and helpful housemaid and caretaker we had while staying here!" Most friendly and helpful housemaid and caretaker we had while staying here! so lovely and great first impression of the house. Couldn't have been more sweet, giving us directions to places to go in town and helping us find affordable transport. If we ever needed help with anything Eseta or Pisa ensured we would get the help we needed and ensured we left with a good impression. Fortunately everything about the house was exceptional, and I don't give praise lightly. It was clean, stylish, roomy with excellent service in both the outdoor deck area where we spent most of our time relaxing and inside. Rooms itself was well equipped and comfortable. I could go on but suffice it to say I was very pleased with my stay, and although it was short and sweet, I hope to be back for a longer visit in the future. The house was amazing, the location was easy to get too, and well mapped out. We loved the gardens, and being able sit with the best view of the coral coast we ever seen. We had three children under 6 who loved the place too, from the short stroll to the pool, clubhouse or shop to catching the local buses with the school kids. Pisa is happy to walk everyone through the gardens and play with the kids. The house is fully equipped, and the furniture made from one of the Fijians furniture store is spectacular. We could have moved in and lived comfortably. We love this place, and will return there for anymore family holidays in Fiji in the future. We had to leave because we couldn't stay any longer. The view and the house was amazing and the house cleaner was wondering did everything she could for us amazing.The location was a bit hard. Top spot to stay, good view, great housekeeping inside and out ,friendly and supportive staff. Our stay in Fiji was amazing thanks to the house we stayed in and the people that helped us around the house. We became very good friends with Eseta and Pisa straight away. Very friendly with a warm welcome. We learnt so much through them with the language and their culture. The traditional Lovo night was one of the best nights we had there. It was perfect. Words can’t describe how happy all 4 of us were with this accommodation. This place is perfect for vacationers and honeymooners! The host has a really special place here. The villa is a fantastic place to stay. Very spacious and very nicely decorated. Well located just some minutes to the biggest resorts. The housekeeper is fantastic and very helpful. Recommend to have the Fijian Lovo. I had a great time there with my family at this beach house the view was great and I liked going to the beach just a 2 min walk the service was great and our house keeper did a great job everyday making our beds and was really kind. We had and amazing lovo dinner on our last night and it was really sad that we had to leave but overall I had an amazing holiday there and had lots of fun. "The property is amazing and the deco is absolutely stunning"
This holiday home is a beautiful home overlooking Maui Bay. We had a great experience from the booking enquiry, the booking, communication and instructions before we arrived and the warm greeting from Lolo, the housekeeper on arrival. The home is gorgeous and spacious and the kitchen was great. There were loads of utensils and great quality linen. The house is presented beautifully with quality furnishings and beautiful floral arrangements. The garden is beautifully kept and we enjoyed the fruits of the garden - sugar cane, bananas and papaya. Lolo made us feel comfortable and cared for even when there were teething problems with an electrical outage on our first day - there are lots of torches and candles in the home and then some gas issues which affected our showers. This was sorted by the next working day and we improvised with bucket baths for a day. We didn't mind though because it all added to the experience and the bathrooms are first class. The beds were comfortable - we had a great sleep once we worked out that we had to completely shut the shutters to block out the noise of the motorway down the road and the waves of the beach. Lolo and her husband cooked us a wonderfully fresh seafood dinner (at extra but reasonable cost) and a Fijian Lovo that was adapted to our taste given we don't eat pork or beef. Lolo made sure my vegetarian mum was catered for as well with a delicious yam curry. My boys still rave about Lolo's Fijian roti. She is a great hostess and an asset to the home. We had a very comfortable and restful stay. This is an an excellent find on the Coral Coast. From the booking process, to the service provided by the staff, it was a wonderful experience. It is close to supermarket, servo, restaurant, bottle shop. There is also a hire car in the servo if you want to explore the area. Fresh fruits and vegies are abundant in little road side markets and if you need a fe luxuries, there is the Naviti resort and Hideaway resort where you can purchase some last minute things like sensible shows to wear to the waterfall at Biausevu. However, I recommend you pack this yourself when you travel as they are at resort prices. Sigatoka is 20 minutes away if you want something else that the local supermarket doesnt stock but you wont need to. You are treated like royalty here away from the hustle and bustle of busy resorts. Take advantage of having a lovo cooked meal by Lolo the housekeper, her husband who is a chef at the Warwick resort and the gardner. Most delicious meal and I would recommend you do the shopping for this yourself. Ask Lolo for what to buy. Lolo also cooked us amazing Fijian meals. She really is a gem. I recommend this for a quite laid back holiday. "Friendly, Fantastic View and Amazing Housekeeper"
This is the best Airbnb place we have ever stayed. The house is amazing. Perfect location. right across from the water. The house looks out over the pacific and is captivating.The best is Eseta, she is the maid and visits every day to make your bed, clean up, do your washing, whatever you want really. Even better is that she is an amazing person. So friendly and helpful, and becomes part of your family. Pisa the gardener is similar. He is also great to have around and is super friendly as well. We will be back here. It’s incredible. Thanks again for an amazing stay.